DISCLAIMER: I AM NOT A DOCTOR or a medical health professional. Always speak with your doctor before trying CBD or any other new drug, supplement, or treatment. Last month, I told you guys about the 40% off sale at Joy Organics – one of my favorite CBD companies. Joy Organics is great because their entire CBD product line contains full spectrum hemp extract that is also 100% THC free. After the sale, I got so many positive emails and reports from so many of you! And I also got a lot of people asking if they were going to do another discount anytime soon. So I reached out to Joy Organics and asked if they could do one more sale, exclusively for the Mind Over Meniere’s community…and they agreed! Today, I’m excited to share an exclusive 30% off sale for Mind Over Meniere’s: Use the offer code MIND30 for 30% off your entire order at Joy Organics. If you missed the big sale last month, you have another chance to purchase Joy Organic’s awesome CBD products at a huge discount! And if you bought CBD during the last sale (maybe for the first time), you have another opportunity to stock up and save big! As many of you know, I’ve used CBD products for several years now to help me manage my Meniere’s Disease symptoms. If you haven’t heard of CBD (short for cannabidiol), here’s a quick overview: CBD is one of 113 cannabinoids (active compounds) found in marijuana/hemp, and is believed to be responsible for many of the medicinal benefits of the plant but none of the psychoactive properties. CBD is non-psychoactive, meaning you can’t get high from consuming it. When I take CBD, it doesn’t seem to directly reduce my symptoms, but it relieves my anxiety and lowers my stress levels more than any other supplement I’ve ever tried. And because Meniere’s disease is so severely worsened by stress and anxiety, CBD makes a huge difference in my quality of life. Now it’s certainly not the only thing I’ve tried that helps my anxiety. I’ve experimented with countless supplements and substances over the years to try to find something that can reliably help me on a regular basis. And I’ve written about some of the other products – like kava– that I also find helpful. But CBD relieves my anxiety without impairing my cognition or causing side effects like many other substances. And as far as I’m concerned, that makes all the difference. When you live with a chronic illness like Meniere’s disease that causes severe brain fog (cognitive impairment) and fatigue, there is a tradeoff you have to make when taking drugs or supplements that can further impair your mental function. Drugs that reduce anxiety/stress sometimes also have a strong psychoactive effect that can worsen brain fog. I’m not saying the tradeoff isn’t worth it, or that you should stop taking these drugs. But it’s a tradeoff nonetheless: mental acuity for anxiety/stress relief. Finding something that could effectively manage my anxiety AND NOT affect my cognitive performance was game changing for me. It’s very much the wild west right now in the CBD world, and that’s a problem because the CBD market has exploded over the last few years. Thousands of companies are popping up left and right, offering a seemingly endless variety of products with little to no oversight. And you don’t always know if you are getting what was advertised. Many companies don’t test the products they are selling for CBD concentration, let alone for contaminants.And pricing varies wildly as the market hasn’t really matured at all. To further complicate matters, everyone reacts differently to CBD. Some people get an immediate effect like I do. It’s subtle but can always tell when it’s working. I feel a calm relaxation in my body and a lessening of my anxiety. Other people don’t notice an immediate effect but find a cumulative benefit from taking every day for several weeks. While a minority of people get no effect at all, at any dose, ever. Because of this, it’s difficult to make an “effective” CBD recommendation, and if you want to try it, you are probably going to have to experiment a bit to figure out what type and dosage works best for you. Sublingual CBD: Medium onset, medium absorption rate, medium duration. And then you have CBD creams and topicals as well, which can work well for certain applications, but aren’t the best product for chronic illness in my opinion. CBD oil is the most commonly available CBD product and the one I recommend most. It can be taken sublingually by leaving it under your tongue for 1-2 minutes before swallowing, or orally by swallowing it immediately or by adding it to food or drinks. It’s also the easiest to work with, as you can adjust the dose in small increments to figure out what works best for you. For a long time, I used CBD oil exclusively. I would take about 10-30mg of CBD in oil form, letting it absorb under my tongue for a minute before swallowing. And I prefer higher concentration CBD oils even though they’re more expensive because you only have to use a tiny amount of oil per serving. I’ve tried a ton of different CBD oils over the past few years, but only really recommend a select few: Joy Organics (which is having a 30% off sale right now for the Meniere’s community – offer code MIND30), CBDistillery, and Charlotte’s Web. I know there are other reputable brands, but I haven’t found anything better than these three as of yet. More recently, I’ve started to use CBD pills and CBD vape pens way more than oil. There are several reasons for this: I already know what dosage works best for me, the effect lasts longer, and the oil carrier in many CBD oils often triggers my reflux. So I’ve been using CBD pills and vape pens more often than not for a while now. 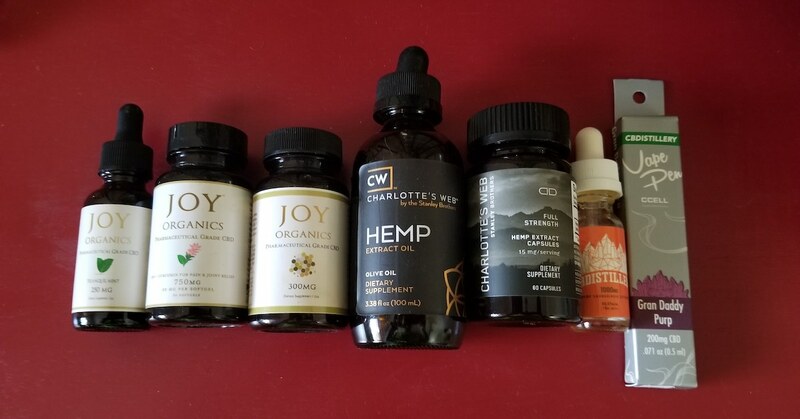 For pills, I alternate between the 25mg softgels with curcumin from Joy Organics (and sometimes the regular 25mg softgels as well), the 15mg capsules from Charlotte’s Web (I take 1 or 2 depending on my stress levels), and the 30mg full spectrum softgels from CBDistillery. For vaping, I use the Joy Organics full spectrum CBD vape pen (currently not available) and the CBDistillery disposable vape pens. Most of the time, I only take CBD at night – every night – about 30 minutes before I go to bed. It doesn’t knock me out, but it calms my mind which helps me fall asleep. Occasionally, I’ll take an additional (smaller) dose in the day time, if my anxiety or stress is spiking for whatever reason. These daytime doses have been more common lately, as I’ve recently gone through one of the most stressful ordeals of my entire life. If you are looking to try CBD for the first time, or if you are simply wanting to try a new company, I always recommend starting with CBD oil. With CBD oil, you can try CBD both orally and sublingually, and you can adjust the dose very easily. This is important because most people have to experiment a bit to figure out what dose works best. If you want a good oil to try, Joy Organic’s full spectrum CBD oils are excellent and 100% THC free, and the sale for Mind Over Meniere’s is happening now – use offer code MIND30 – for 30% off your order! I recommend the 500 or 1000mg oil in the tranquil mint flavor, but the other flavors are great too. Alternatively, CBDistillery’s CBD oils are also fantastic, but like most CBD oils, they contain trace quantities of THC, which may be an issue for some people. I also always recommend starting small and slowly increasing your dose. At higher dosages, I experience a few minor side effects like a slight head pressure and a little bit of fatigue. So a very small dose of 5mg CBD is a good place to start, and you can slowly increase the dose from there to try to find the smallest effective dose for you. I hope you guys find this little guide helpful! If you’ve tried CBD for Meniere’s disease or tinnitus, tell us about your experience! Leave a comment below. NOTE: When I first discovered Joy Organics, I reached out to them and they sent me several free products to test out. I receive many free products (and purchase many products too) but only ever end up writing about a very small percentage of them that work well for me and that I stand behind and actually use. Some of the links featured in this post are affiliate links. If you decide to purchase a product through these links, Mind Over Meniere’s may receive a small commission that goes toward the maintenance cost of the website. Meniere's Bulletin: Tinnitus Research, CBD Recipes, Q/A Sessions and more! I’ve used both the CBD oil sublingually and CBD pure hemp capsules which I get here in a store in Dublin Ireland. I found the oil good for anxiety spikes, but found the capsules better for a prolonged effect. Both helped me with stress and anxiety and sleep. I used to take mine in the morning but intend to start taking at night when I get them again. I don’t know if Joy Organics or Charlottes Web are stocked here in Ireland. Could you try to find out for me? Hi Aideen, I’m glad you find it so helpful! My experience is very similar to yours. But I’m 99% sure that neither of these brands are available in Europe. There are many reputable European brands though. https://www.cannawell.co.uk/ and https://www.endoca.com/en-gb are two that I’ve heard are good! Hi Glen, I find that if I take some CBD cream or lotion and rub it just below my ear it seems to help with the fullness feeling, Best Chas. Interesting! Thanks for sharing Chas! Thank you for sharing! I have been using CBD oil for anxiety caused by tinnitus. Mish it’s just MIND30 – there is no exclamation point on the end of it. I just tested it, it’s still working and should be active through Sunday.